In order to create an effective interface between local/national and regional perspectives, the organization has identified three critical roles to play for the network: (i) a bottom-up communications pipeline for raising the voices of citizens and civil society up to the governmental and regional levels; (ii) a top-down pipeline for educating and informing citizens and civil society on Nile issues and development projects, etc. ; and, (iii) a horizontal pipeline between citizens and civil society organizations both within and across national borders for knowledge and capacity sharing. These roles have been built into a five year strategy (2013- 2017); they are also accepted by the riparian governments, donors and partners as NBD’s niche and value addition to nurturing cooperation in the Nile Basin. The project will address "Green growth for sustainable livelihoods" through increasing fruit tree cover using green and low carbon technologies, inspiring small-scale farmers to promote a market oriented climate resilient agriculture. The overall objective of this proposal is to empower small-scale farmers with skills of green technologies in climate resilient agriculture for sustainable livelihoods. The project starts in May, 2017 to September, 2019, where the two organizations mentioned above intend to, with funding from the Nordic Climate Facility (NCF) implement the mentioned project. This project shall be managed in consortium with the Swedish Meteorological and Hydrological Institute as lead while the two local organizations shall be the local implementing partners in eight (8) sectors which include Juru, Mareba, Kamabuye, Rilima, Ruhuha, Nyarugenge, Rweru and Ngeruka of Bugesera District. The said project will span for a period of 30 start-up funded months but shall continue after then with joint effort of the implementing organizations and community groups with guidance and advisory of the District authorities. The project has also a carbon sequestration aspect where emissions reduction shall start at 4 years to 25 years of age, where, amount of carbon reduced from atmosphere shall be monitored to attract further carbon credits. Technical aspects required for the equipment under this lot shall be of ability to irrigate grafted mango, orange, pawpaw, tree tomato and avocado trees. The size of land to be irrigated per each sysem in each of the sites in every single sector is between 1 to 2 Ha of land. This should be able to support nursery beds and seedlings to maturity where minimum period of operation should be 5 years. The system should be able to operate between 2-4 hours daily. 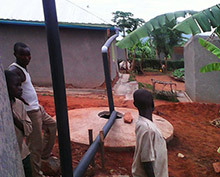 The pumping system is crucial for drought or dry season. Better recommendations as per experts’ experience are also added value. Also, all sites are between 50 to 100 meters from water sources. Site visits would be highly recommended for bidders. The installation shall be done in Juru,Rilima,Rweru and Kamabuye Sectors of Bugesera District. 1	Specification	6,000 Lit/day at Total Head 30 mtr. 1	Specification	12,000 Lit/day at Total Head 50 mtr. □	Determine the quantity, quality and voltage of the solar equipments to be used at each site if different from above; but should not below the limits stated above already. Lot 2: Development of nursery bed sites that will produce 100,000 improved fruit tree seedlings by grafting. Seedling production is one of the key steps in domestication of any species, where each step has to be properly planned and implemented. 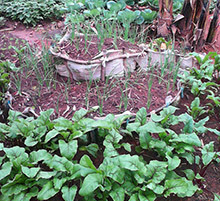 The way seedlings are handled and managed in a nursery determines their survival after planting. Improving seedling quality means they will give superior survival, growth and productivity. Seedling quality is governed by the genetic make-up of the parent trees, and the physical growth of the seedlings. At present the need to plant trees on farms is on the increase. It is difficult, however, for smallholders to access – at the right time, in the right quantities and of high quality – the trees that they want to plant. In order to meet present and future demand for planting materials, there is a need to promote on-farm and community tree nurseries. The sites will be located in Juru,Rilima,Rweru and Kamabuye Sectors of Bugesera District. 2. Ability to carry out progressive on-field training sessions with 200 community beneficiaries during the execution period. 12. Interested suppliers should submit well printed quotations and technical documents. A selection of the partner will be based on the above mentioned requirements and will be subject to review by technical evaluation team of the NBDF Rwanda Steering Committee. A contract shall be established between the parties and be governed by the Rwandan Law.